"Throughout my 30+ years as a gardening journalist I’ve never come across a bin quite like it." I’ve always been an enthusiastic gardener and avid composter. After all, why throw away waste that can be converted into valuable compost for use around the garden. It also saves money on buying bags of soil improver too! For the past four years my HOTBIN compost bin has been in constant use, recycling every scrap of my compostable kitchen waste. Hot composting really makes sense, and I find it far quicker and more efficient than my other ‘cold composting’ bins. Throughout my 30+ years as a gardening journalist I’ve never come across a bin quite like it. Traditional bins made from wood have their place, as do those made from recycled plastic, but the HOTBIN’s unique polypropylene design and construction with its excellent heat retaining properties mean that hot composting can take place all-year-round. Even in the depths of winter the contents of my bin remain warm enough for bacteria, fungi and other microorganisms to continue working. When there’s frost on the ground, it’s reassuring to open my bin and release clouds of steam into the air. I regularly monitor the composting process on two thermometers – one in the lid, and the other inside the bin, with its probe plunged deep into the heart of the heap. Every few weeks I ‘fire up’ the temperature by mixing in a few grass clippings, and what a thrill it is to see the temperature rise to 65˚C (150˚F). So, what do I feed my HOTBIN? Virtually everything from my kitchen that’s compostable goes in from fruit and vegetable peelings to banana skins, tea bags to coffee grounds, and even crushed egg shells. It’s fine to wrap vegetable peeling in a few sheets of newspaper before adding them to the bin. My local council won’t take cardboard egg boxes in their green recycling bin, so I tear them up into small pieces and mix into my HOTBIN instead. Adding card or scrunched-up paper helps keep the contents airy, and I often chuck in a few handfuls of shredded paper too, including my junk mail! Small quantities of food waste are also sometimes added, such as cooked rice or pasta, or the remains of cooked vegetables or mouldy bread. And garden waste can go in too, particularly weeds, soft prunings and old cut flowers that all rot down quickly. Once compost builds-up in my HOTBIN it’s time to open the panel in the base and remove a few buckets full of beautiful compost. The upper layers slowly sink under their weight to create more space above, and the front panel can be refitted and strapped back in place. I fork this compost into borders to improve my soil, and chuck a few handfuls into the bottom of holes before planting out shrubs, bedding plants and crops. I’ve never noticed any unpleasant smell coming from my HOTBIN, and haven’t had any problem with vermin either. 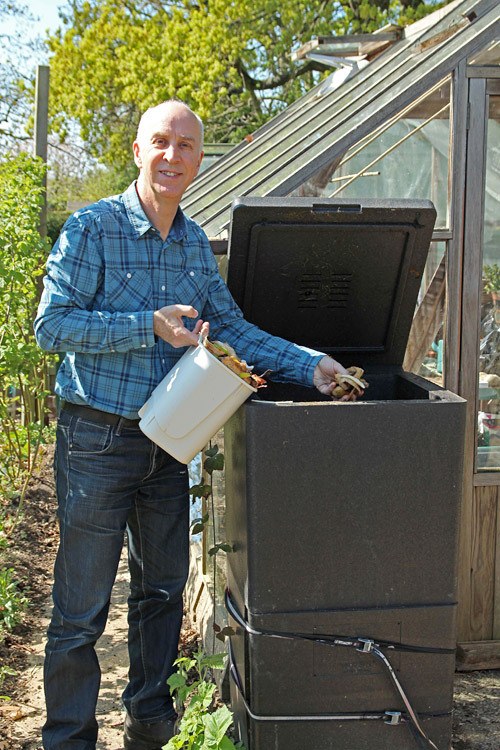 The HOTBIN has a great 200 litre capacity, is robust and easy to use, and quickly produces great compost – just perfect for a keen gardener like me. Adam Pasco has been a leading gardening journalist in the UK for over 30 years, successfully launching and editing BBC Gardeners' World Magazine for 22 of these. He now runs his own company, Adam Pasco Media, as a writer and content provider, lecturer, and consultant to clients in the gardening industry. He has twice been crowned 'Editor of the Year' by the British Society of Magazine Editors, and been awarded 'Practical Journalist of the Year' by the Garden Media Guild. Adam broadcasts for World Radio Gardening, runs an impressive garden picture library, and presents videos for gardening clients, including B&Q.